Often times the Propertybase support team needs access to your account in order to resolve support requests. When submitting a support request it's a good idea to make sure our team has temporary account access - even if it ends up not being necessary. This article will walk through that process. 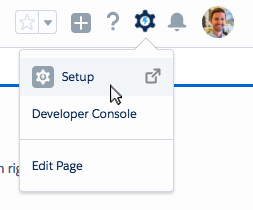 The following guide will show you how to grant Propertybase Support, Salesforce.com Support or your system administrator access to your account. Click your profile image at the top of the screen, then click Settings. Next click Grant Account Login Access in the Quick Find menu. Click the dropdown next to who you would like to grant access to and select how long you want to grant access. Done! Continue with your support request knowing that Propertybase has access to your account. Click Company Information in the Quick Find menu. 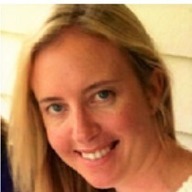 On this page locate your Salesforce ID. Click on your name at the top of the page and then select "My Settings". This will bring you to your personal Profile settings. Click the plus sign (+) and then "Grant Account Login Access". Then you will be able to select the duration of access for the Propertybase Support team. Finally click "Save". The video below demonstrates how to grant access to Propertybase Support using the old Setup interface. If your screen looks different you are on the Classic Interface, please click the Classic Interface link for appropriate instructions. 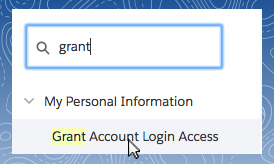 Setup > search for Grant > Grant Login Access.